I noticed that Sandy's, on 16th off Fifth, is Closed for Renovation. I hope they will reopen, and figure out a way of attracting a steadier business. Owner Elia is one of the nicest people around, and I'd really like to see the cafe flourishing. I think the most recent incarnations tried to offer perhaps too many choices - it was at its best when Elia ran the show, with a limited selection of cold & hot drinks, desserts, empanadas, and (of course) the best tamales around. Come back soon, Sandy's! Astoria. I spoke to a man sitting in a vacant corner lot. He had cleared it of trash and planted it with flowers, & small painted wind sculptures he'd created himself. Now it's a Dream Park. Demo is underway at 715-721 Sixth Avenue (the former Lafayette Glass warehouse, and a residential building next-door). Plans were filed for a new, five-story building last November, but have not yet been approved. A trio of classic grocery stores I saw in Queens over the weekend. A feast for the eyes. There are signs up for Giocare at Fifth & 15th, and it appears the well-regarded playschool moved from 18th Street to its new premises over the summer. The first floor space on Fifth was previously occupied by Avalon Childcare, which closed in 2015, after a history of safety violations, and more recent allegations of abuse. It's not clear if the center ever re-opened. In 2011, a three-month old baby who attended Avalon Academy - a separate site on 15th Street run by the same owner - died after falling unconscious at the nursery center, At the time of the incident, criminality was not suspected. A Daily News story on safety issues at city childcare centers, which was published early this year, included a look at both Avalon nurseries, both of which had checkered safety records. At the time of the story Avalon Academy was still open for business, & today it is still listed as open online, as is Avalon Childcare in Red Hook. Farther north at Fifth & 12th, the ever-mysterious La Royale,(formerly Mezzini), whose presence on the avenue is intriguingly resilient,has been given a spruce up in recent weeks. While the curtains there have been habitually pulled closed over the years, sometimes now they're pulled right back, and the windows are opened wide. Saturday was one of those exciting occasions. I noticed fresh shrubbery out on the sidewalk too, along with a length of artificial sod. A couple of ladies whose relationship to the place was unclear - diners? friends of the staff? PR of some description - lingered on the sidewalk. The restaurant was empty inside, but at least there was a bit of a show going on outside. On Sunday afternoon though - a time you'd think perfect for summer business, the shop was closed. Across from La Royale at Jo, Brian & Joseph's Food Market (no longer Key Food), a large plate-glass window has remained broken for a couple of weeks or more, leaving a gaping hole and a patchwork of cardboard covering the window from inside. It's taking surprisingly long for this to get fixed, and I feel sorry for the cashiers whose check-out counters are right by the window. The corner store has had its ups and downs, but the current management is certainly better than the previous one, and the workers are very friendly. Hope the fix-up comes soon. The Societa S. Clemente da Casamarciano once met at this Ravenswood building, The inscription on the building is dated 1947, & the society apparently left a good while ago. Casamarciano is a municipality of Naples. I walked past the Societa building the other day. A few doors down, a surprise in the streetscape. Who was this distinguished figure, gazing with gravity over a garden hedge?. You could only see his head & shoulders, but you could tell he was a cut above your average front yard statuary. I stopped to take a closer look, and just then the owner of the garden came by. He invited me through the front gate to get a better view . Could it be? Yes! Here was S. Clemente himself (AKA Pope Clement I), standing on a brick plinth, which was also supporting an engraved granite plaque. The plaque bore the names of the Societa members who had paid for the statue. I don't know quite how the saint arrived in the garden, but the owner, who moved to the block a couple of decades ago, seemed to have inherited him, and he told me the block was all Italian once. S. Clemente got lucky to have found such a kind and attentive custodian, who clearly enjoyed the holy presence. He told me he regularly touched up the gold on the papal tiara. The Virgin Mary, however, a modest looking figure in a grotto nearby, was cared for by other hands. His wife had forbidden him to touch her. A RAvenswood telephone exchange. Two-letter five-digit telephone exchanges were introduced in New York in 1930, (replacing the three letter, four-digit exchanges), and were changed to all numbers in 1960. But the older exchanges were not officially removed from the white pages of directories until 1978. The two-five format still lingers on older business signs around the city. Pink shorts & walking stick, red shirt, & jacket. A natty combo. In January I noticed that the owners of two buildings on Third Avenue (577-579) & a lot on 16th, purchased in 2015 for over three million dollars, were attempting a flip, with the properties listed for $6,900,000, and plans for a seven-story residential building filed. Plans still await approval, and no new property sales have been recorded. Demolition's on the way though. Here's a better look at the stretch of small, pre-1880 rowhouses between 15th & 16th. 579 is at left. 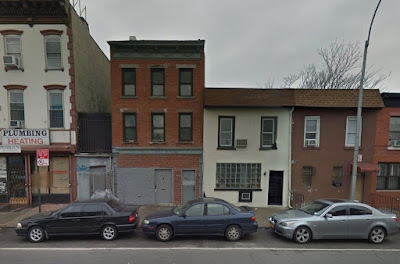 I don't remember seeing this house on 4th Street (Gowanus) before, but I guess it's been around for a couple of years. The architect is Philippe Baumann, and the one-family "Roman courtyard meets derelict garage" replaces a one-story building. It's a modern, minimalist design, with an open courtyard & many energy-saving features. You can see some interior photographs at the architect's website, along with an ominous courtyardHAUS video walkthrough. The front of the building is covered with a "galvanized steel screen with operating shutters" which "insulates the wood facade from the street and forms an enclosed smoking porch." Though the shutters can be opened, as seen online, when I went by the place was all screened, making it look a) excessively defensive or b) somewhat penitentiary. "Is very bad, bad chicken cutlet. Is tough and tasteless. I can't eat it. How do they serve this cutlet?" "The tourists eat this cutlet." "Hypothermia, hypoglycemia, I don't know, something like that." "I tell you. He has no idea, but you, you are like me. You know how to make things." Large lady in bathing suit embracing child in salty, sandy, sentimental hug. "But Grandma, I'll see see you tomorrow!" With demolition & new building permits in place, the Villa Lillian Long (316 12th Street) will be departing shortly. The sidewalk tree in front of the house has been fenced off, a likely sign of imminent house demolition. As we noted back in December, a four family, four-story plus penthouse is on the way, with the architect on record as Wu Chen of Infocus Design. Unfortunately, the website for Infocus appears to have disappeared, but the company is responsible for a number of similar sized apartments in the city, including 315, on the same block. The developer is Omri Bar-Mashiah, who ... well, you can read about some of his earlier work here. 316 was sold in June for $1,900,000. Two wooden houses that fell into decline, and suffered fire-damage, have recently disappeared. Plans were recently filed for a commercial building at 147 11th Street, which was to replace a small, low-lying frame house, whose history you can read a little more of here. Its condition had become perilous, and likely demolition was inevitable, but we had developed a certain, irrational fondness for it. Over on 23rd Street, a fire broke out in June at 193, described on the NYC Fire Wire Facebook page as a "a dwelling with colliers (sic) mansion conditions." The badly-damaged building was ordered demolished by HPD. Looks like that facade is the 1959 original. Overall, four violations remain open. This promises to be a squat & shallow sort of hotel, with excellent views of expressway traffic. It might cater to an interesting dual-niche market - johns & Robert Moses acolytes. Whoever ends up taking a room here - I hope the place is soundproofed.